For those who want to experience the Caribbean, Jimmy Buffet-style, it's hard to beat the "sun sand and sips" ambience of a Windjammer sailboat. The second vessel in Island Windjammers' fleet, 125-foot Sagitta maintains the charm of its smaller counterpart Diamant while embarking from easier-to-get-to ports. Now-defunct Windjammer Barefoot Cruises had quite the Bacchanalian reputation, complete with wild costume parties and constant drinking games. Island Windjammers is decidedly tamer, with most passengers coming aboard for snorkeling and the chance to view the Caribbean at close range. Most days are spent hanging out with fellow sun-seekers, swapping stories and socializing. Those who do imbibe will appreciate Sagitta's always-available cooler full of beer and soda, rum punche and free-flowing wine at dinner -- all included in the price. Passengers are also allowed to bring their own liquor onboard without restrictions, a welcome contrast to most mainstream lines. One feature of small ships is that they can anchor in bays and marinas where larger cruise ships can't go. For the most part, Island Windjammers includes a few well-traveled ports in Sagitta's itinerary; we embarked in St. Maarten, for example, and the ship will move into the U.S. and British Virgin Islands in 2015. But it also hits offbeat stops, such as Anguilla, Nevis and St. Eustatius, making it a perfect vessel for the island collector. There's no getting around it: On a ship this size, you do feel the ocean's motion, and it can take a day or two to adjust, particularly when traversing open water. You'll also experience close quarters, as the ship only holds 24 passengers in sailing-style cabins. A few obnoxious people could really make an impact on your trip. 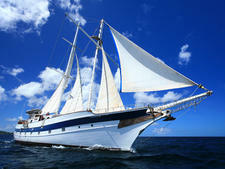 Yet, despite these limitations, Windjammer cruising attracts a lively crowd that tends to go with the flow. You're likely to walk away from Sagitta with a bunch of new best friends -- so your Margaritaville memories might last long after your cruise. 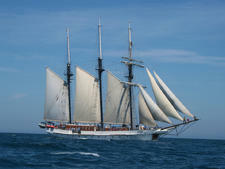 Sagitta attracts small-ship devotees, many of whom sailed with the original Windjammer Barefoot Cruises. Expect mostly North American Baby Boomers, with a few old salts in their 80s (although the casual nature of the ship is attracting more and more 30- and 40-somethings). Get a pedicure before you go; in true barefoot fashion, Sagitta encourages passengers to leave their sandals on the top deck. Swimsuits, T-shirts and cover-ups dominate during the day, with shorts and sundresses sufficing for dinner.